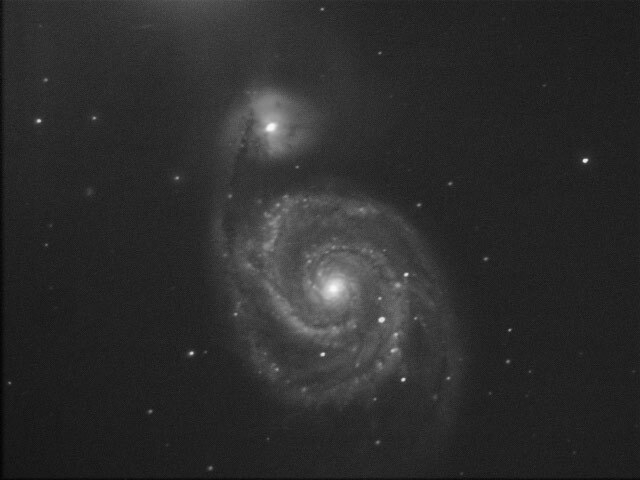 My first decent attempt at M51 this season. The rising moon made things a bit bright towards the end of the session, but I was pleased to capture the parts of the outer halo at the top and the two smaller galaxies IC4277 and IC4278. This was an experiment with longer exposures and less gain. This is evident in the less than perfect starshapes. Captured in K3ccdtools, stacked in registax 3. Dark and sigma clipping. Exported to photoshop as tiff. Curves in photoshop. Core and bright stars desaturated with less processed layer. Slight unsharp masking.